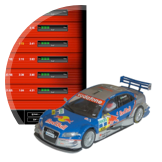 SCX D RMS or PCLapCounter are the ony and best race management accessories in the market for SCX Digital and offers the most professional race management information on fuel consumption, lap timing, speed and driver position. We have quite a lot a happy customers and still growing. SCX D RMS and/or PCLapCounter do have various different features. Detailed information can be found in the support / FAQ area. SCX D RMS - the SCX D „touch Version“. PCLapCounter - the „Pro Version“. Main race features are included in both versions. What is SCX D RMS ? A USB Interface connected between your track and your PC. Either RMS or PCLapCounter. Depending on your personal feature requirements.